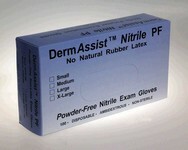 Sempermed USA SemperCare Nitrile Exam Glove, Nitrile, Small, Powder Free (PF), 200/BX, 10 BX/CS. Manufactured as a co-polymer glove to provide a better fit and feel than before. This non-latex alernative is now made stronger through a manufacturing process called "fusion" bonding. "Fusion" bonding integrates synthetic polymers into the material to create a multi-layer glove for enhancd protection. 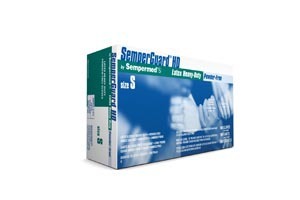 Provides a better tensile strength and elasticity without sacrificing barrier protection. It has a lower modulus to reduce hand fatigue and porvides more comfort. With greater strength, a better fit and feel, you get a nitrile glove that is safer and more durable to work with for longer periods of time. Better elasticity. Lower modulus. Tested for protection against chemotherapy drugs. Eliminates aerosolization of glove powder.